Soferet Linda Coppleson shows religious school students how she repairs a letter. A committee — chaired by Mike Sandler, and including Bob Pollack, Mary Kuller, and Vicki’s husband, Rob Tuckman, and, ex-officio, Handler and congregation president Larry Leder — decided to use the donations to the Rabbi Vicki Memorial Fund to restore a Torah scroll left with the community by Rabbi Albert Ginsburgh the synagogue’s first religious leader, who served from 1970 to 1992. The scroll, repaired with parchments from Holocaust-era Torah scrolls, was used regularly until 15 years ago, when it was set aside because it became frayed and some letters were worn out and hard to read. At that time Temple Micah bought another scroll, with the help of sofer Neil Yerman in New York. Bringing back an old Torah scroll, committee members thought, was a reflection not only of Tuckman’s devotion to her faith, but of her commitment to the mitzva of bal tashchit — literally “do not destroy” and taken as an injunction against waste — which she fulfilled by diligently composting and recycling, including reusing textbooks in the religious school Tuckman headed, as a means of preserving the environment. To repair the Ginsburgh Torah, the committee selected Linda Coppleson, a soferet from West Orange. Their choice of a woman to perform the restoration was a reminder of all Tuckman had done to benefit the women of her congregation. 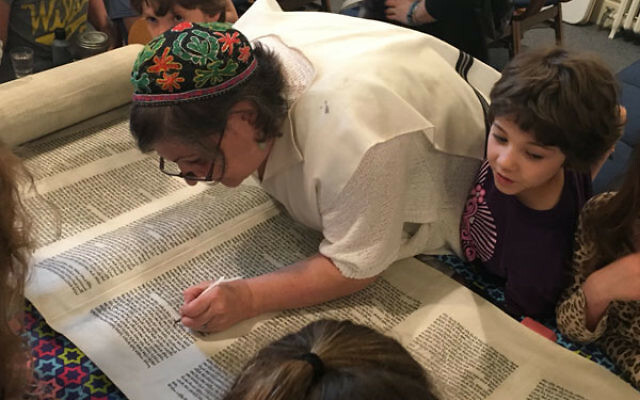 Coppleson provided opportunities for students to participate: In one session, she demonstrated the steps to repairing a Torah scroll and how the letters are formed; later, show showed them how the last parchment of the Torah scroll is connected to the etz chaim, the roller. 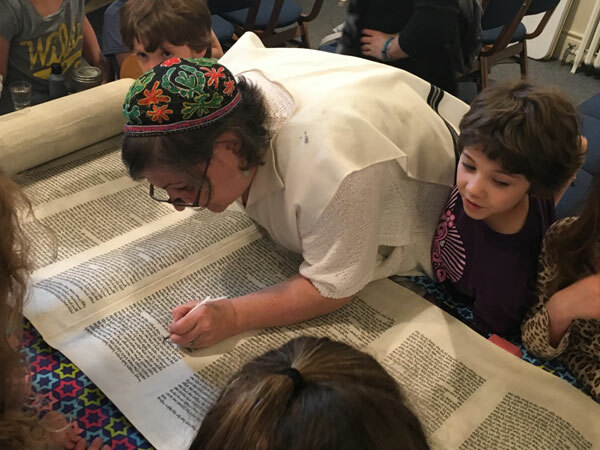 On May 15, adults from Temple Micah as well as members of the Presbyterian Church of Lawrenceville, where the synagogue has met for over 40 years, watched Coppleson complete the scroll, with each person present “inscribing” a letter. “Linda held the quill with the feather and you put your hand on top of hers, and she would inscribe the letter, saying a prayer before and after,” Sandler explained. The Torah scroll was formally presented to the congregation for its first use on Rosh Hashana, with both scrolls dressed in their High Holy Day covers, one depicting an olive tree and the other, donated by Rob Tuckman and his family in Vicki’s memory, the Tree of Life.